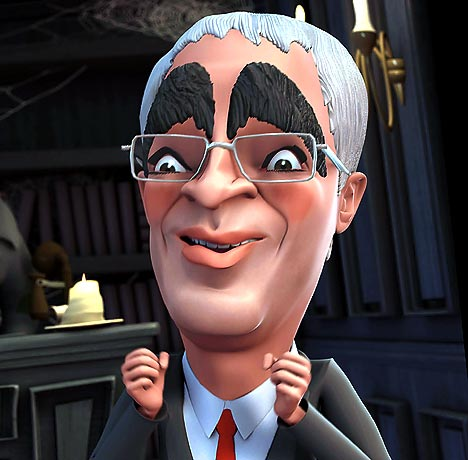 It’s looking more and more likely that the government’s resident badger impressionist, Alistair Darling, is going to announce on April 22nd that old cars (over 10 years) scrapped when a new car is bought will get the owner a £2,000 incentive. Other European countries have implemented similar schemes – in Germany, for example, car sales increased by 40% in March compared with a year earlier. Compare that with the UK where new car sales fell again in March with new registrations down 30.5 percent against March 2008. And assumming a new car typically costs about £16,000 so the government won’t even be out of pocket (VAT alone is £2,400 before road tax etc), so why is this idea straight from the “MG Rover” department of naivity and idiocy? New cars are more efficient than older cars. Heavier maybe, but more efficient. A 2.0 manual petrol Ford Focus in 2000 produced 204g/km of CO2. 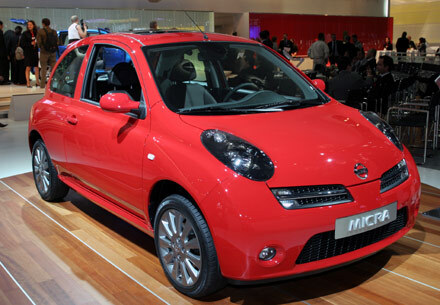 A 2007 model produces 169g/km. Progress indeed. However, manufacturers are also getting much better at tuning their car’s to perform well in the standard EU test cycle. With modern fuel injection systems, it’s simple to tune a car for ecomony at test speeds, yet still be able to publish good horsepower figures for selling cars. So anyone who believed we’ve really seen a true 17% improvement in CO2 for Ford Foci in 7 years is kidding themselves. The SMMT shows that the average g/km of new cars sold in the UK between 1999 and Q2 2008 has dropped from 190 g/km to just 160 g/km today. Very admirable, however we need to remember these are “new” cars. And in 1999 people were buying 4x4s like hot cakes. Today though, the SUV / 4×4 has become ostracised from society and sales have fallen off a cliff. 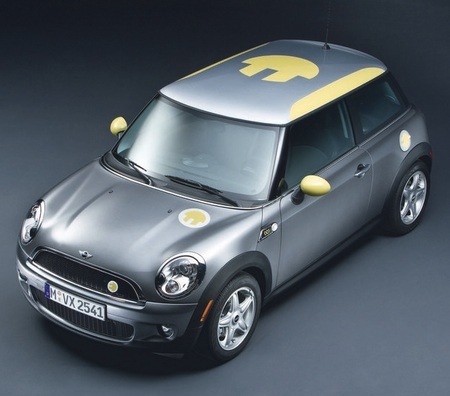 In fact the only area of the car market that’s growing is small cars, and they always have a low g/km figure. So of those 30g/km reduction, probably half of it is as a result of cars becoming more efficient, rather than an overall shift in buying trends away from 4x4s to smaller cars. We also need to remember the CO2 required to build the car. There are a variety of sources for this, from the energy required to build the car (welding / pressing etc), the energy required for production of parts from raw materials and even the footprint required to scrap and recycle a vehicle. The SMMT (Society for Motor Manufacturers and Traders) gives an official figure of about a tonne of CO2 for this whole process. This is widely believed to be far too low. So let’s say that 1000kg of CO2 is created building a new car, that’s 1,000,000 g of CO2. And lets say that 30g/km is actually saved by getting a newer, smaller, more efficient car through the scrappage scheme. To offset the impact of manufacturing would take a minimum of 20,000 miles of driving, or almost one complete lap of the earth. Another source is Professor Julia King, vice-chancellor of Aston University who for the Governmenet calculated that 85% of a car’s CO2 is from fuel , 10% production and 5% destruction. In the simplest terms that means owning one car is 8% more CO2 efficient than owning 2 cars over the same period. There is no doubt that the economy is the primary focus here, and the government are desperately trying to shore up what remains of the British motor industry. However, 85% of the cars sold in the country are imported from abroad. So if you were really trying to help the British industry, you’d be better taking the protectionist route and giving a subsidy just for British built vehicles of….£13,333. And we should also remember that evidence in Germany has shown people are buying smaller cars (for example the VW Polo – ironically built for VW in Spain), and in the UK we manufacture just 2 small cars, the Mini and the Nissan Micra, which together make up just 5% of the UK market. So most of the public money spent will benefit other nations, rather than our own motor industry. And what about the miriad of garages and parts manufacturers who keep the older cars running? 95% are based in the UK, and the plethora of new cars on the road will put many more of them out of business. Here’s the kicker with new cars. Some cars can loose 50% of their value in the first year of registration. And this is only going to get worse – what is the market for a 1 year old car going to be like if you can get £2,000 off a new one? And your £2,000 saving? The moment you drive off the forecourt that will be lost in depreciation anyway. And this is the big one that everyone appears to have missed. This is not a scheme that can last forever, as there is no reason why the government should subsidise one industry (making up a relatively small part of our economy nowadays) while others feel the pain of a recession. All it will do is create a “Christmas / January Sales” effect pushing the problem down the line where everyone shops now, then the market dries up requiring huge discounting just to get any sales at all. No doubt there will be a strong take-up initially (who doesn’t want £2,000 free from the government coffers? ), and people are already holding off buying new cars on the expectation of the grant, further hurting the industry (why would you buy now anyway if this is coming?). But what happens next? All the grants are given out, then what? An even worse drought in car sales, that’s what. So what should we do? Simple, take the estimated £1bn earmarked for the scheme and invest in research and development in the UK. That’s enough to create jobs for 10,000 people for 3 years developing the new technologies required for the drastic advances needed in automotive technology. The sad truth is that the UK’s cost base is never going to be able to complete with developing nations in manufacturing cars in the long term. Maybe today, yes, but not in 10 years. To really help the industry we need to be at the cutting edge of plug in hybrids, lightweight manufacturing techniques and the next generation of vehicles. The internal combustion engine has done well for us for 100 years, but it’s becoming increasingly clear that in it’s current form, it has a finite life span, and if the government wants to have a UK motor industry it needs to get ahead of the curve and be at the cutting edge of the next generation of cars. 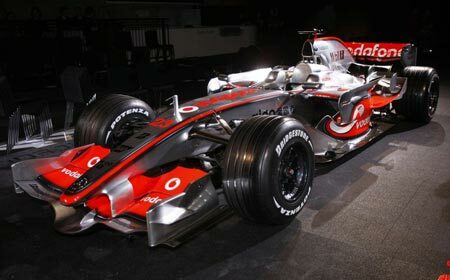 What’s the carbon footprint of a Formula One (F1) car? Let’s compare an F1 car to a typical car in the UK which produces about 160 g/km, and over a year (10,000 miles) will produce about 2.56 tonnes of CO2. According to Wikipedia a typical F1 burns 75 litres of fuel per 100km raced. Based on figures for petrol (which is a reasonable proxy of race fuel), 0.75 litres of fuel burnt per km equates to a CO2 output of 1737 g/km. And over a race season using approx 100,000 litres of the stuff, that’s 231 tonnes of CO2. Per car. And each team has 2. So for fuel alone, before the costs of flying to races, support vehicles and the number of cows required to furnish Max Mosley’s “special” wardrobe, that’s about 463 tonnes per team. I wonder if they carbon offset? Fantastic news! Climate change has been abated by car manufacturers. According to Autocar/ Clean Green Cars, the average CO2 emissions for new cars now stands at 156.6g/km – that’s 7.4g/km less than a year ago. 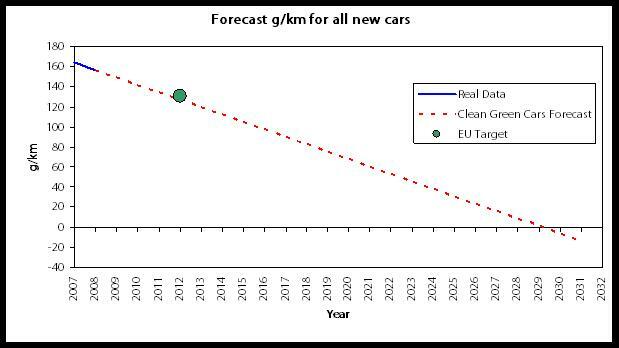 And at that rate of decline manufacturers are going to reach the EU’s proposed 130g/km target by 2012. That’s great news. What’s even better is that if you continue this trend past 2012, then by 2030 we’re going to be driving cars which actually burn petrol / diesel and remove CO2 from the atmosphere as if by magic. A brave new world, I’m sure you’ll agree. Or it might just be the case that most cars have improved by a more realistic 2.5-3%, but people have stopped buying big luxury cars and 4x4s (sales dropped by 40%-ish for each). Sadly at some point we’re going to run out of people who are going to stop buying 4x4s as they will have already stopped. And at that point, we’re just going to revert to a more 2.5%-3%. And forecasting 4 years into the future, based on 2 data-points is a dangerous game. What produces more CO2? UK Speed bumps or Fiji? Speed-bump, road hump, speed ramp or sleeping policemen. Let’s face it by any name they are the bane of urban driving (unless of course you make your living selling replacement shock absorbers). They’re a hassle, damage cars and cause urbanites to drive otherwise unnecessary 4x4s (in my experience anyway). Yes, average speeds are reduced, but so is your attention of what’s up ahead as you’re trying not to clout your exhaust on that unnecessary piece of road calming. Other complaints made against them are that they slow down emergency services (endangering lives), they are particularly unhealthy for people with back or neck pain and create noise for local residents. But I can add another one, that they’re giving the poor Polar Bears an early bath. Yup, that speed bump round the corner on Mornington Close is directly responsible for the increasing popularity of bear-centric swimming lessons at the North Pole. So let me tell you how…. The AA (Automobile Association) did a bit of research on fuel consumption for cars at the Millbrook Proving Ground and found that a typical mid-size car running at a constant 30 mph did 58 mpg. However a car slowing down and speeding up for speed bumps only did 31 mpg. Put that into carbon figures* for a petrol car** and you get 113 g/km of CO2 at a constant 30mph, or 211 g/km over speed bumps. So a kilometer of road with speed bumps creates an extra 0.1kg of CO2 for every single car that travels it. For argument’s sake, lets say this km of road has on a average a car going each way down it every minute during the day and night***. In a year, that means a single stretch of road creates an extra 103 tonnes of unnecessary CO2 per year. We’re making estimates here, but if that km of road has 10 of the UK’s estimated 100,000 speed humps, then speed bumps in Britain are responsible for a colossal 1.03 million tonnes of CO2 per year. 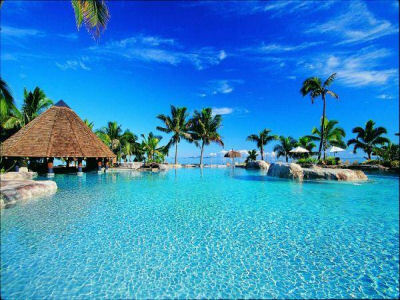 That’s about the same as the total carbon footprint of the 830,000 residents of Fiji, or almost twice that of Greenland. Ouch. You can console yourself that as a UK taxpayer, based on the estimate that 50 standard humps on three or four connecting residential streets costs about £150,000. So the UK speed hump population cost us £300 million pounds. Which is about what Newcastle United would cost you if you wondered up to St James’ Park with a really big chequebook this morning. Sports cars. With the exception of the real die-hard lentil sandal wearing environ-mentalists, most people love the idea of a sports car. But admit that at an Islington dinner party and it’s about as PC as claiming you’re Osama Bin Laden’s tennis partner. So can you really have a green sports car? Arguably the greatest ever car designer was a chap called Colin Chapman who founded Lotus. His most famous quote on making fast cars was “Simplify and add lightness”. He also said “Any car which holds together for a whole race is too heavy”, but let’s not worry about that right now. Chapman believed that to make a car faster you make it lighter. If a car is lighter, then you need smaller brakes, a smaller engine, smaller tyres and so on to get the same level of performance. Which means the car is lighter still, creating a rather nice virtuous circle. You also save fuel costs, for example reducing the weight of a car by 100kg will save you about 900 litres of fuel over it’s lifetime*. That’s about £1,200 at today’s fuel prices. Then again you could also argue that by cutting down on the burgers and losing 10 kg, that would save you £120! Chapman sadly died in 1982, but I suspect he’s turning in his grave as he sees how bloated and overweight cars have become. What’s frightening is the statistic that although the average weight of a car in Europe is around 1,200 kg, in the US it is 2,000 kg. In the last 25 years since his death, the average weight of cars has increased by 60% in some classes**. And cars on average are getting heavier by 16kg every year***. 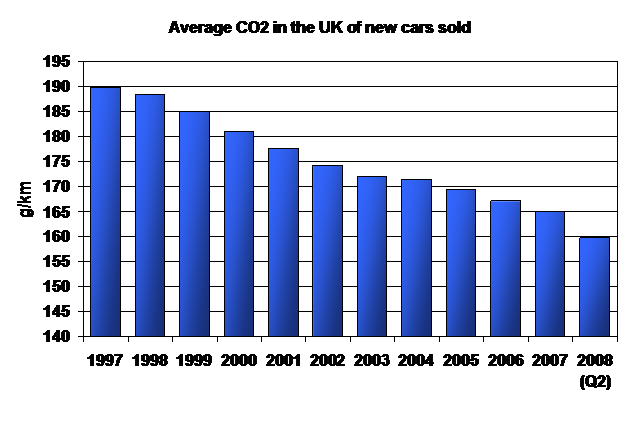 Very interesting, but what relevance does this have to CO2 or that lovely sports car you want? Well, to get a car to any speed you need to add energy. 0.5 x the mass of the car x the speed**** (squared) to be exact. Halve the weight of the car, and you halve the energy needed, and halve the fuel required to get to that speed, and the amount of CO2 that gets produced as well. The same is true with speed as well, except the amount of energy required is squared. So to get 100mph requires 4 times the energy to get to 50mph. Admittedly once you’re at speed, then the aerodynamics play more of a part in how much fuel is burnt (and CO2 that is produced), but lets concentrate on the weight for now. The trouble with this kinetic energy is that when you slow down it’s changed into heat in the brakes, and it’s gone. This is where regenerative braking comes in. Hybrids and Electric cars can use their motors as generators and save this energy to use again. But they’re still thin on the ground, and unless you have £100,000 for a Tesla Roadster (www.teslamotors.com) you’re out of luck if you want a sports car. So where does that leave us? Well, funnily enough where we started with Lotus. Generally 2 seater sports cars tend to weigh in between 1,200 and 1,500kg*****. A Lotus Elise in 1996 weighed just 720kg. Even now with airbags, safety equipment and crumple zones it weighs about 900kg. That means it needs a smaller engine, brakes and so on to give the same performance. And that also means less CO2. As an example, a £140,000 Ferrari 430 will hit 60mph in 4 seconds and produce 420 g/km of CO2. 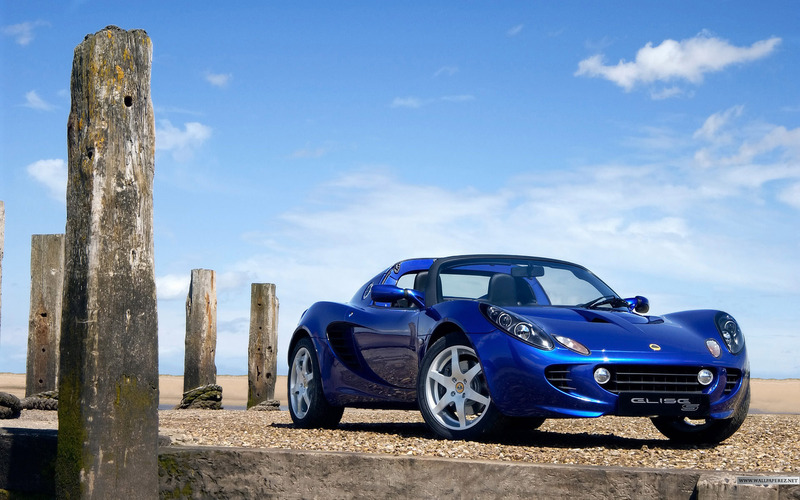 A £32,000 Lotus Elise SC will hit 60 in 4.4 seconds and produce 202 g/km. Which is less than a bog standard Volvo estate. So there you go. If you want to go green, but still want a sports car, then buy a Lotus. How much CO2 does the Toyota Prius really produce? Hollywood loves the Toyota Prius for the green image it purveys to celebrities who have a carbon footprint several times that of the average citizen. Middle England loves the Toyota Prius because over a dinner party they can tell their neighbours they drive a hybrid car. I even like the Toyota Prius because it has raised awareness of hybrid technologies to the world, and brought them into the public consciousness. But is it as green as Toyota claim? Well, the official CO2 figure for the Prius is 104 g/km, which is equivalent to 62.8 mpg (although Toyota actually claim 65.7 – someone in Japan has their maths wrong there). Now DEFRA in their guidelines to the carbon offsetting quality standard (which is soon to be released) says that reported g/km “factors must be uplifted by 15% to take into account ‘real-world’ driving conditions”. This is not Prius-specific, but does admit that even the government doesn’t believe the CO2 figures they use to tax us on. 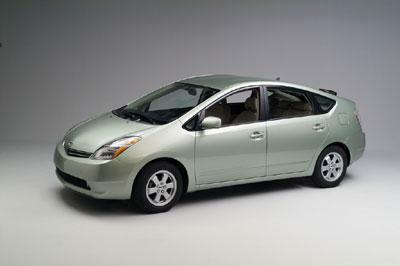 With this uplift, the Prius would now be at 119.6g/km (54.6 mpg) which on the face of it seems more reasonable. In independent tests the Toyota has also failed to live up to its claimed efficiency, with What Car (1) recording 52mpg, The Sunday Times (2) recorded 48.1 mpg on a long journey and owners typically reporting between 53 & 54mpg. This gives us a worst of 48.1mpg and a best of 54mpg. Translating that into CO2, that’s 121 to 136 g/km of CO2. So not bad, but still 16-31% higher than Toyota claim (104 g/km) and very misleading. It’s also worth remembering that a hybrid engine is only beneficial for lots of stop start driving. 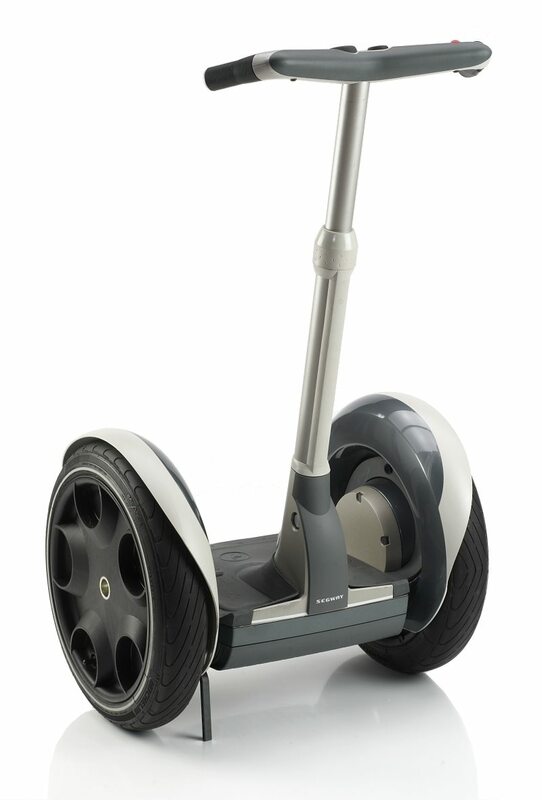 Running at constant speed there is no benefit over a normal engine, and in fact a disadvantage because you are carrying the extra weight of unused batteries and motor. It’s also worth noting that fuel consumption (and hence CO2) is all about your driving style and not what you drive. 91mpg was achieved by a chap called Will from Warwick Uni (3) in a VW polo Bluemotion, in excess of the claimed 74.3mpg and that included traffic on the M25. A Prius will also cost you more than an equivalent non-hybrid car, and the extra money you spend will take a long time to recoup (if ever). And if you were thinking about buying one to replace your old car, remember that means that somewhere another vehicle needs to be manufactured with all the raw materials that entails. So, if you want to show people you care about the environment, enjoy looking smug at dinner parties or star in Hollywood blockbusters, then the Prius is the car for you. If you simply want to save fuel & money, lower your carbon footprint and actually do something for the environment, then improve your driving style and follow the example of Will from Warwick.